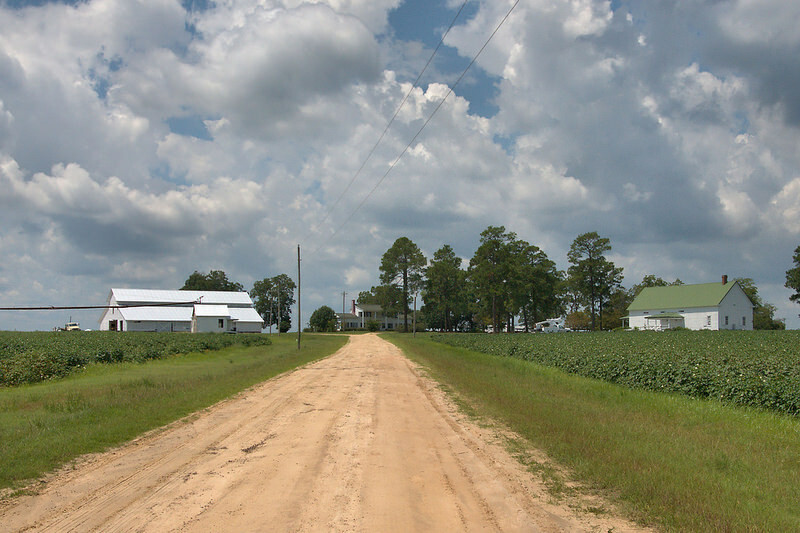 In its heyday, Excelsior was the cultural center of Bulloch County (this part of old Bulloch is now located in Candler County), and Josh Everett was one of its pioneer settlers. While this house was being built, his family lived in a log cabin which was later moved for use as a servants’ dwelling. 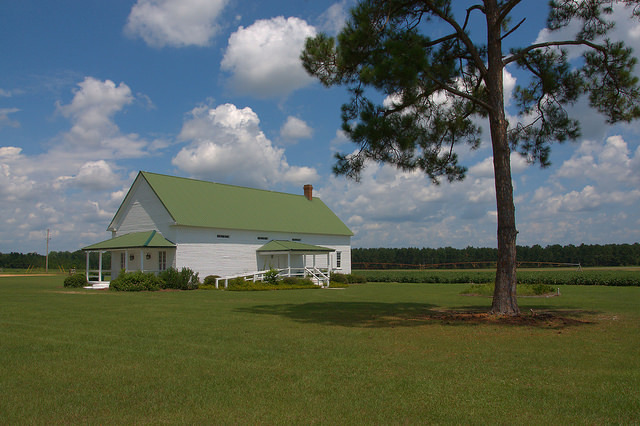 The house was originally built in the Plantation Plain style(circa 1866); the wings were added later as the family grew. 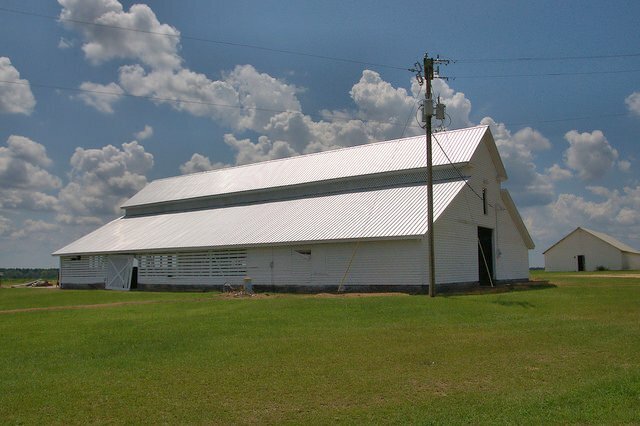 This mule & horse barn, a landmark in its own right, was built around the same time as the store across the road (1900). Mr. Everett had a nail for every mule and horse. Each one’s gear was on a different nail. There was also a sawmill beyond the barn. You know when you see it from Dutch Ford Road that it’s quite special, the sort of historic farmstead that is all too rare today. 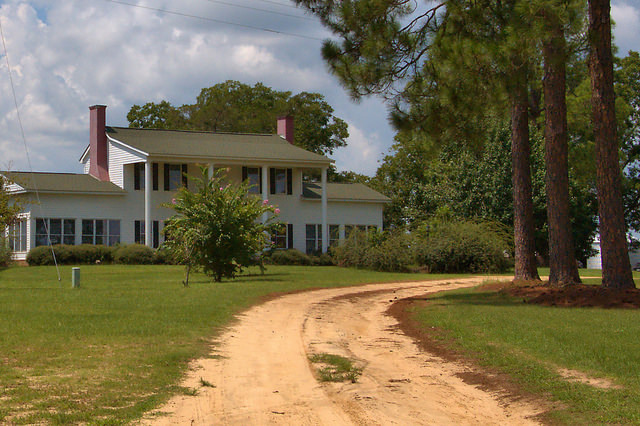 Howard Bland and Fate DeLoach bought the property in 1940 and it remained in the DeLoach family until 1988. Thanks to the Nevil family, who recognize its historic importance, it’s still a working farm and has been given a dual purpose as Dutch Ford Farms Wedding & Event Venue. Susan Nevil gladly shared its amazing story. If you need a great location for a wedding or family reunion, get in touch with them via their Facebook page. I can’t imagine a more peaceful place for hosting an unforgettable event. Josh Everett originally had a small commissary or farm store beside his house, but his business grew so much that he built this store in front of the house to accommodate it. 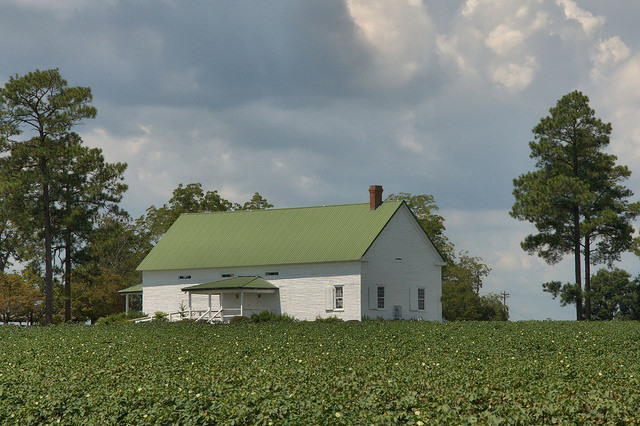 Seeing it over the cotton plants, I was just sure that this was originally a Primitive Baptist Church, as the design is similar to many of them I’ve photographed, but thanks to Susan Nevil, I now know the real history.Viewed from the front, it’s more obvious that it was a country store. It did serve briefly as a church in 1984 (though that is a small part of its story) after a tornado destroyed the Excelsior Baptist Church. That summer, the ladies of the church cleaned out the old store and put it to use while a new church was being built. The church also began a mission with the Hispanic community at that time and it has grown into today’s Iglesia Cristiana Hispana in Metter. 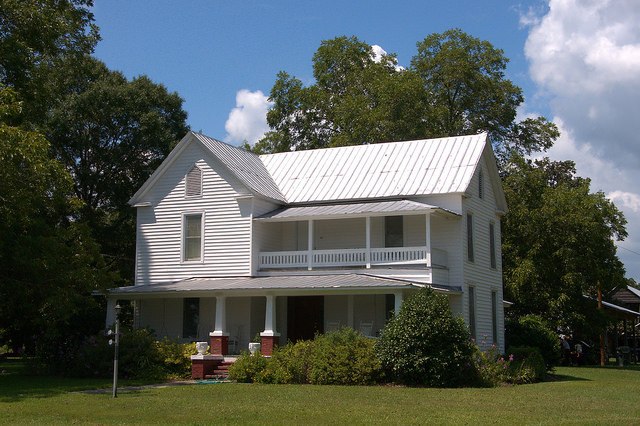 Near this wonderful old farmhouse, which is still the heart of a working farm, a historical marker placed by the Averitt Foundation reads: Excelsior was the cultural center of Bulloch County in the late 1800s before it became part of Candler County. It was founded in 1875 on land donated by Jimerson Kennedy, Remer Franklin, W. W. Olliff, Dr. Jeff Williams, and John G. Jones. These founders desired to build a “good and permanent school” for their children, so they funded the construction of Excelsior Academy. It was built in a place thought of as the town square, surrounded by oak and pine trees. It attracted students from nearby areas who boarded with community members during the school term. Its teachers were often affiliated with the Baptist church in town. The academy drew newcomers to Excelsior, which grew after its establishment. The Excelsior News (1877) became the first newspaper in Bulloch County and also served people in neighboring areas. Olliff’s General Store on the outskirts of town was another community staple. After nearby areas grew due to railway construction in the early 1900s, they siphoned off the population of Excelsior. The academy became a primary school in a sparsely populated town.